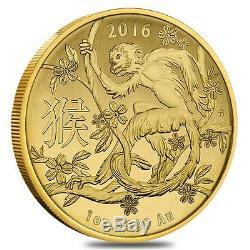 2016 1 oz Gold Lunar Year of the Monkey Coin. 9999 Fine BU - Australian Royal Mint. 9999 Fine BU (In Capsule) - Australian Royal Mint. In celebration of the 2016 Chinese New Year, the illustrious Royal Australian Mint has released the'Year of the Monkey' gold coin series. These charming and lavishly crafted coins have been struck in 99.99% fine gold. The Royal Australian Mint incorporated remarkable detail in this stunning gold coin, appealing to both investors and collectors alike for its high purity and sheer elegance. The 2016 Lunar Year of the Monkey Gold Series is the perfect gift for anyone born in the year of the monkey. Those born in the Year of the Monkey are described as naturally quick-witted and are problem solvers much like the clever animal. The Chinese Zodiac or Shngxiào is a tradition based on a 12-year mathematical cycle, with each year being represented by an animal and their reputed attributes. Customarily these zodiac creatures were utilized to date the years. Occupying the 9th position in the Chinese Zodiac, the Monkey possesses characteristics such as curiosity, mischievousness, and cleverness. Perpetually fun loving, Monkeys are also considered inherently intellectual and creative. Monkeys are quite resourceful and thrive on being challenged which is a testament to their ingenuity. The Year of the Monkey is said to represent a year of great tranquility and financial success. Bullion Exchanges is pleased to carry these exquisite gold coins, which are composed of 1 oz of 99.99% fine gold. The reverse side features a handsomely intricate rendering of a skillful monkey moving along braches of a blooming tree and the Chinese Character'', which transcribes as "monkey" in English. The highest point of the reverse side bares the inscription "2016" while the base features the coin's metal weight and fineness, 1 oz. The obverse side features the effigy of her Majesty Queen Elizabeth II, along with the inscriptions "ELIZABETH II", "Australia", and the face value of the coin. The obverse side is encircled by portrayals of the 12 signs and moon phases of the Chinese Zodiac. This playful animal is not only loved around the world, but the Chinese Zodiac represents a tradition which is still popular adding to this unique coins appeal. Add a 1 oz 2016 Year of the Monkey Gold Coin to your cart today. Like all of our other gold coins, Bullion Exchanges guarantees this product to be 100% authentic. Packages are no longer insured if tracking information shows the package is delivered. We will only cover packages that are lost in transit or damaged. Once an order is placed it cannot be modified or cancelled. Using digital video, we record the packing of our products to affirm accuracy. We do not accept American Express at this time. Please note that bullion coins, bars, and rounds are mass-produced and are not struck to the same quality standards as collector coins. These Bullion products are not certified and therefore will not always be 100% perfect. Purchasing bullion and/or coins involves price risk, and the purchaser assumes all such risk. We do not offer or make price adjustments based on the market fluctuations of precious metals, or for any other reason. For our store FAQs page. 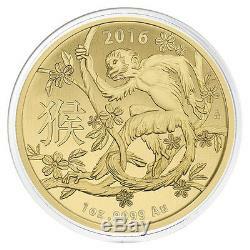 The item "2016 1 oz Gold Lunar Year of the Monkey Coin. 9999 Fine BU Australian Royal Mi" is in sale since Thursday, September 17, 2015. This item is in the category "Coins & Paper Money\Bullion\Gold\Coins".exchanges" and is located in New York, New York.